VIVA (Vuelos Internacionales de Vacaciones) Air was set up in 1988 by 2 national airlines, Iberia and Lufthansa. Operations commenced with a Boeing 737-300 on April 15th, 1988. The inaugural flight was from Palma de Mallorca (homebase) to Nuremberg. But the 2 partners split up and Iberia took full control in 1992. 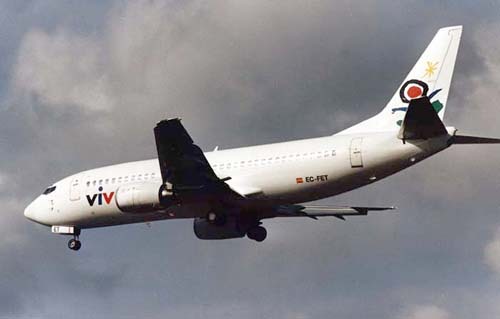 VIVA went into scheduled operations using DC-9s, but these were not profitable and Iberia reorganised things again. Viva Air went into charter work again with routes into Europe. At one time the fleet existed of 10 Boeing 737s. However, 1997 and 1998 produced losses upto usd 30 million and Iberia decided to give up the subsidiary. In November 1998 Viva Air ceased its operations and was liquidated. The staff, aircraft and route licences were taken over by Iberia. On the photo can be seen Boeing 737-3Q8 EC-FET (cn24132/1555) on final approach into Amsterdam Int'l, cleared to land on runway 19R (april 1992).